Detail : Paul's eighth solo single. This incarnation featuring : Paul, Linda, and Denny Laine. Henry McCullough and Denny Seiwell having just left the group. Helen Wheels was the name Paul gave to his Land Rover, and the song tells the story of a trip from Paul's Scottish farm down to London. Although Paul was down to a trio for the A-side, the B-side had already been recorded with all five members. 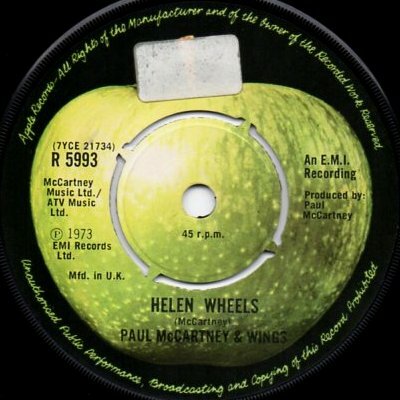 The single was not released in a picture sleeve, but was available in the yellow "Wings" cover.